Hello everyone, sorry I didn’t post yesterday I was so tired after my first day at Miss Selfridge I just had no energy, but I can report back that I am enjoying my placement so far. I’ve been collating images from all the fashion week shows and then creating boards today for the design team to use as inspiration for the A/W 2013 season, exciting stuff! Anyway onto my post today and… it’s another haul, yippeee!! My friend Jess introduced me to Fragrance Direct and their very low discounted prices on all sorts of brands so I decided to place a small order of some products I’ve wanted to try out for a while. Tigi S Factor Smoothing Lusterizer (Defrizzer & Tamer) – I have wanted to try this out for sooo long, every since Zoe from Zoella said that she used it to tame the frizziness of her hair as my hair is a sorry mess as it is quite damaged from the constant dying over the last few years. I love the smell of this stuff it smells of Calpol, how awesome! O.P.I Nail Lacquer ‘Fiercely Fiona’ – Now I was scoping the brands they stock and when I saw they stocked O.P.I for £5 a bottle I instantly needed one as I love O.P.I and they had so many shades to choose from so I decided to order a shade I didn’t already own so I ended choosing the shade ‘Fiercely Fiona’ which is a lime/yellow shade which I know what you’re all thinking but from online swatches I quite liked the shade as it could be nice for the summer months. Calvin Klein Creme Lipstick’s – As I seem to be obsessed with lipsticks at the moment I decided to order a couple of these as my friend Jess ordered a bunch of these for £1.99 each, yes £1.99 for CK lipsticks who can’t resist that?! From the online swatches I’m pretty impressed with the shades I ordered which were ‘Flutter’ which is a light coral/red shade which I actually wore today and I really like this shade as a lighter shade and ‘Fusion’ which is a deepish pinky/plum colour which I was scared would be similar to the Topshop lipstick I bought the other day but thankfully it’s not as dark. I also made a small order from ASOS as I received an email on Sunday with a 20% off code that ran out that day so I decided to treat myself…. 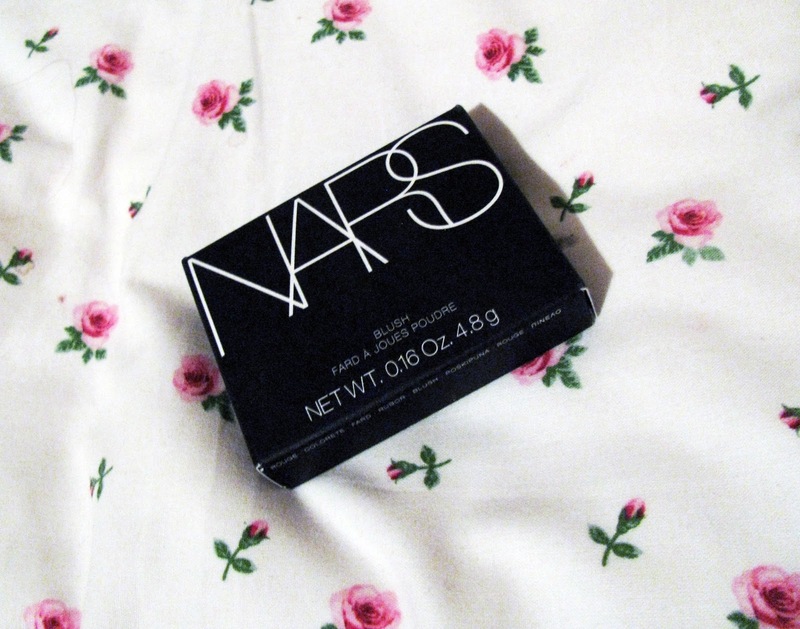 Nars Blush ‘Luster’ – Yes, I bought my first ever Nars product (yayyyyy!) I have been wanted a blush or bronzer from Nars for so so long and with the blush being cheaper I opted for the blush in a more bronzer shade, clever thinking there Charlotte. Now I did some serious research into what shade to purchase and I ended up purchasing ‘Luster’ and I am so so so so so happy with the shade it is perfect! I will be reviewing this soon for you all with added swatches and thoughts as I haven’t properly used it yet. As you can tell I was/am overly excited about this purchase! I hope you are all having a lovely week and I will hopefully be posting again this week!